The California Building Standards Commission unanimously voted in favor of requiring new residential units of up to three stories to have solar-paneling installations, including apartments and condos. The requirement goes into effect in 2020. Once “solar electricity generation is factored in”, homes are projected to use 53% less energy than those built under the previous standards. In light of the catastrophic wild fires California has suffered from in the past year, solar panels could be helpful in the future, help(ing) people stuck in extended periods of power outages. California, a place of many recent firsts, will soon be the first state to require solar panels on all newly built homes. On Wednesday, the California Building Standards Commission unanimously voted in favor of requiring new residential units of up to three stories to have solar-paneling installations, including apartments and condos. The requirement goes into effect in 2020. Among the good news is that, at minimum, single-family houses built under the new standard are predicted to use about 7 percent less energy than those built according to the current standards, last updated two years ago, because they will include energy-efficient features like thermal envelopes in walls and windows. Once “solar electricity generation is factored in”, homes are projected to use 53 percent less energy than those built under the previous standards, the California Energy Commission report said. Greenhouse gas emissions will be reduced by 700,000 metric tons in three years, which is “equivalent to taking 115,000 fossil fuel cars off the road,” concluded the report. Not surprisingly, the 2019 requirements will bring upon dramatic changes to the look and function of California homes. With the mandate in place, newly built residential homes are encouraged to have “battery storage and heat pump water heaters,” the California Energy Commission report said. Moreover, nonresidential buildings are encouraged to make “maximum use of LED technology” for indoor and outdoor lighting. To comply with the newest mandate, but avoid paying upfront costs, Californians can either lease the solar panels or sign a “power purchase agreement,” Drew Bohan, executive director of the energy commission said. 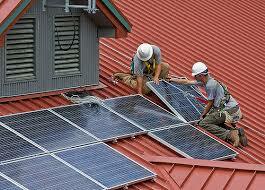 The agreement will pay for electricity without homeowners having to buy the panels. When having individual solar panels is not feasible, homeowners must have access to a community solar project instead, which will have the capacity to power multiple buildings. In light of the catastrophic wild fires California has suffered from in the past year, speakers at the Wednesday public hearing emphasized that solar panels could be helpful in the future if such disasters were to strike again, reported NPR. For one thing, solar panels could help people stuck in extended periods of power outages. With California electricity utility PG&E under scrutiny for allegedly causing the recent Camp Fire in North California, fire, any move that reduces dependence on traditional electricity delivery could come as a relief to many Californians, even though they’ll remain just as connected to the grid. However it shakes out, the policy will be a boon to the solar industry. Right now, only 15 percent of homes are built with solar in California, so the requirement will bring a “big boost” to the industry.